Another little peak into my $100 bathroom makeover. 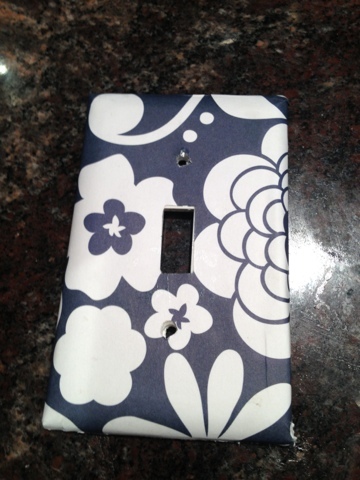 This update to the light switch covers didn't cost me a dime, but it makes a big impact. I love how they add a pop of navy and coordinate with my new blue and white bathroom. Here's how I did it. 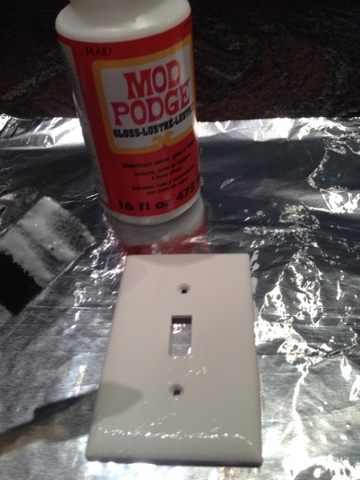 First I removed the light switch plates and cleaned and dried them really well. Then I found some coordinating scrapbook paper in my stash (wrapping paper would work, too). 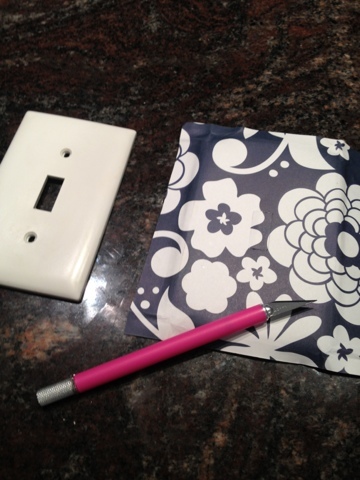 I started by cutting the piece of paper slightly larger than the light switch cover. 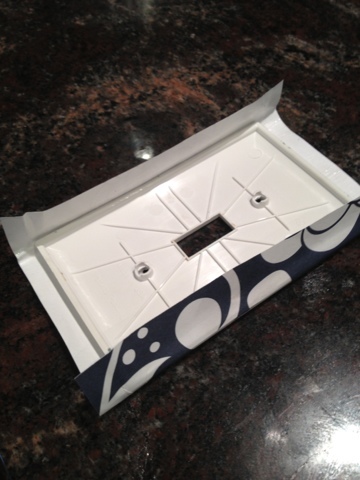 Then I used an exacto knife to cut out the center spot where the switch goes through and the two screw holes. 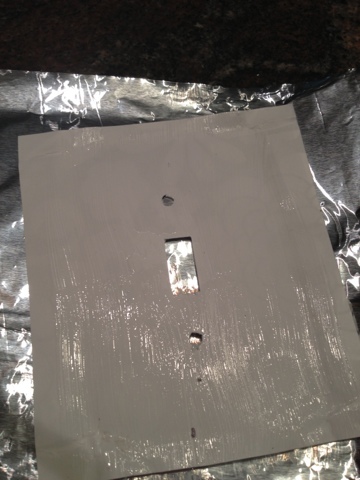 Next, I used a foam brush to cover the back of the paper and the front of the light switch cover with mod podge. I used gloss, but matte would be fine too - it doesn't matter for this step. I pressed the paper down really well concentrating on the edges. 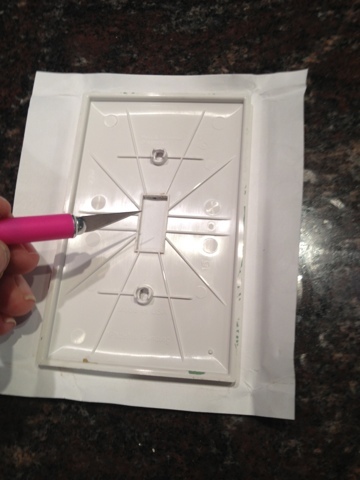 If they don't stick, don't worry, after you cut the paper down you can add more mod podge and work on them and the corners. I let this dry for about an hour. 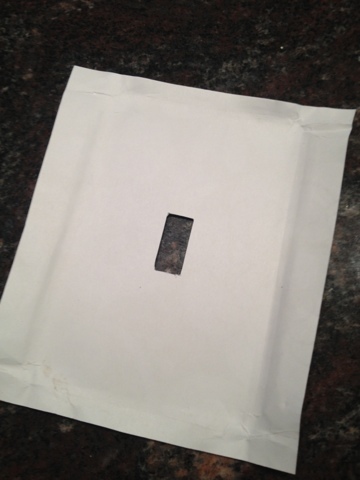 After the paper was good and stuck on the switch cover, I cut the paper down to size. Then I added a medium layer of mod podge on the printed side of the paper (what is now the front of the light switch cover). At this point I really worked on the edges and corner. It helps to cut a small diagonal cut leading to the corner so you don't get wrinkling. Just keep working on them until they stick down. I recommend you let this dry for several hours...and here's why.... 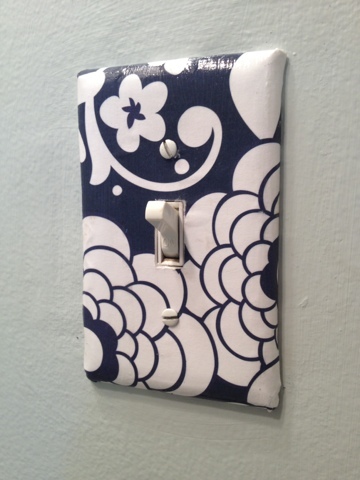 I got so excited about my new light switch covers that I impatiently put one up after only an hour. As soon as I screwed in the screw, it tore the paper which was still wet. I had to take the entire thing off and start all over again. So there's your warning on not being too hasty. I know the hardest part is waiting when it comes to this kind of stuff, but unless you want to start all over I'd suggest busying yourself with another project - like this pallet board shelf - so you're not tempted like I was. My son loved Bob Marley when he was a teen. I came up with some ideas to add to his posters and a light switch cover was one. I printed a photo of Mr. Marley and lined it up on the face plate. Unfortunately I had to cut a hole in Bob's face but it wasn't too bad. My son loved it! 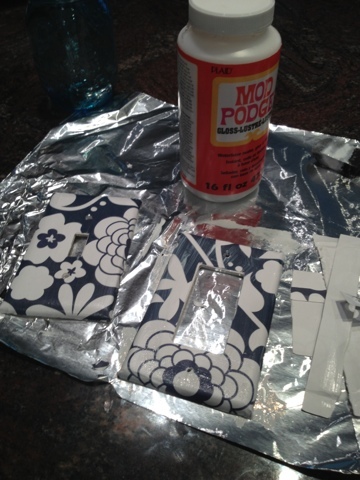 I didn't have mod podge so I used white glue and a little water. Lot's of fun!